This article first appeared in The Edge Malaysia Weekly, on September 25, 2017 - October 01, 2017. CIMB Group Holdings Bhd’s Japanese shareholder of 43 years and one of its biggest over the last decade, Mitsubishi UFJ Financial Group Inc (MUFG), made an unexpected exit from the country’s second largest banking group last Wednesday. It sold its entire 4.56% stake, or 412.51 million shares, through an overnight block trade at RM6.20 a share, or RM2.56 billion in total. It was a 4% discount to last Tuesday’s closing price of RM6.46. According to Bloomberg, the shares had been offered to investors at a range of RM6.15 to RM6.30 apiece. Two thirds of the shares went to foreign shareholders, including fund managers, sources say. Industry observers say MUFG’s 43 years in CIMB is possibly one of the longest ever that a foreign investor has held on to a Malaysian bank. MUFG first became a shareholder in the group in 1974, when it made an investment through one of its predecessors, The Sanwa Bank Ltd.
Interestingly, MUFG’s exit comes even as another Japanese investor, Sumitomo Mitsui Banking Corp (SMBC), is considering divesting its stake in RHB Bank Bhd, a lender with which it has had a relationship spanning over 40 years. SMBC is mulling over the sale of its 0.06% stake, or 2.359 million shares, in RHB Bank, a source tells The Edge. The stake was valued at RM12.46 million, based on RHB Bank’s closing price of RM5.28 a share last Thursday. MUFG’s exit from CIMB came as somewhat of a surprise to analysts, but they say the move makes sense as the Japanese financial group needs to optimise capital amid stricter requirements under Basel III. “The sale makes sense. Any banking group with small equity stakes [in other financial institutions] would want to tidy up their holdings because they weigh on risk-weighted assets. Divesting such stakes could improve capital efficiency,” says a local banking analyst. MUFG’s stake in CIMB was held through its subsidiary, The Bank of Tokyo-Mitsubishi UFJ Ltd (BTMU). BTMU’s Common Equity Tier 1 (CET 1) ratio, at 11.34% as at end-June, was the lowest among Japan’s three major banks. SMBC’s stood at 13.11% while Mizuho Bank’s was at 11.46%. Maybank Invesment Bank Research, in a report on CIMB last Wednesday, says MUFG’s sale of CIMB shares could boost BTMU’s CET 1 ratio slightly to 11.4%. An MUFG spokesperson confirms that the decision to sell the CIMB shares was to improve capital efficiency. She stresses that the sale did not imply a change in its view of CIMB’s prospects. “The sale of shares is for the purpose of the improvement of capital efficiency of MUFG/BTMU, and the implementation of the sale of shares does not mean that [we] have changed our regional strategy. Asia remains one of the most important regions for us. Therefore, there is no impact on MUFG/BTMU’s business in Malaysia,” Kana Nagamitsu, of MUFG’s public relations division, tells The Edge via email. She adds that the group will continue to collaborate with CIMB, despite no longer being a shareholder. For decades, it has cooperated with CIMB in many areas, including commercial banking, investment banking, Islamic finance and asset management. “We will continue to have a collaboration with CIMB. [The sale] does not imply a change in our view of the prospect of CIMB going forward ... it’s very much an internally MUFG/BTMU-driven decision. In fact, there will be no change in the status of CIMB as one of our alliance partners in Asean,” she says. In a press release posted on its website on Sept 20, MUFG says it sold its CIMB stake as part of a larger plan to optimise capital management amid tightened international financial regulations and changes in the business environment. “In such a context, MUFG is conducting a review of existing strategic investments by the MUFG group of companies from the viewpoint of strategy, capital efficiency and profitability of investment, among others,” it says. Nomura Research, in a note on MUFG, says it views the sale as a positive step in the Japanese group’s review of its existing investment portfolio, which forms part of its initiatives to improve productivity under the “MUFG Re-imagining Strategy”, which it unveiled in May. “Given the size of the sale at over ¥60 billion, we think this move will send a clear message that MUFG, as a megabank that has seen its profitability decline under its previous strategy of expansion, is becoming more selective in its portfolio in order to prioritise productivity and investment efficiency,” its analyst Ken Takamiya says. MUFG got the equivalent of about ¥68 billion from the sale. The sale will have only a minor impact on MUFG’s and BTMU’s financial results for the year ending March 31, 2018 (FY2018), MUFG says. MUFG’s net profit has declined over the last two years, from ¥1.03 trillion in FY2015 to ¥951.4 billion in FY2016 and ¥926.4 billion in FY2017. Its shareholding in CIMB has varied over the years. In the last decade, the largest stake it held was 5.02%, in 2013. It has one representative on CIMB’s board, namely Hiroaki Demizu. Now that it has exited the Malaysian lender, it is understood that he will resign from the board. CIMB, in response to questions from The Edge, notes that, as with many banks around the world, capital optimisation is an important theme. “The evolution of capital allocation and treatment over recent years means that capital management has become increasingly challenging for all banks,” a spokesperson says. In fact, CIMB, too, is in the process of divesting its 18.21% stake in Bank of Yingkou in China on the back of capital treatment and priorities, the spokesperson adds. MUFG’s exit comes during a year in which shares of banks, including CIMB’s, have run up as investors bet on a recovery in earnings after tepid growth in the previous year. 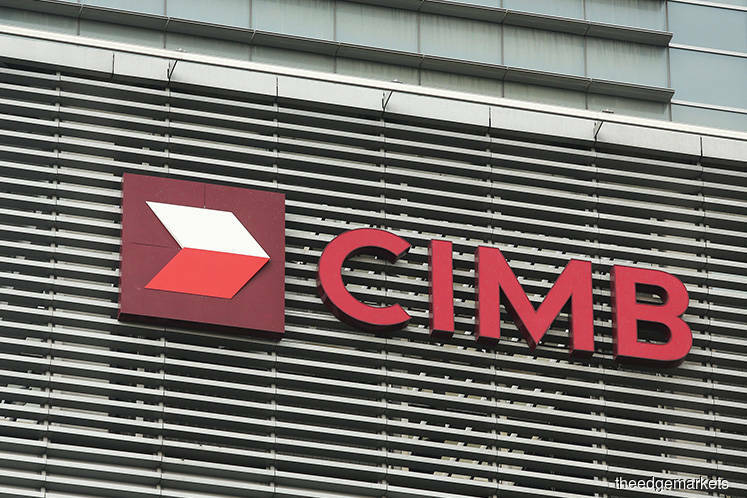 CIMB’s share price has risen 43.86% so far this year, hitting a high of RM7.08 on Aug 30. The counter closed at RM6.35 last Thursday. Nomura Research believes the shares still have upside potential. It upgraded the stock to a “buy” from “neutral” last Thursday and raised its target price by RM1.50 to RM7.90, citing CIMB as the only stock within its coverage of Malaysian banks to have a meaningful return on equity (ROE) turnaround story. It expects CIMB’s ROE to rise from 8.2% in 2016 to around 10% in 2018, notwithstanding the impact from the MFRS9 accounting standard, which will kick in from next year. Maybank IB, meanwhile, maintains a “buy” on CIMB with a RM7.50 target price.